Some of the best geysers of Iceland and even whole world are located in Haukadalur geothermal field. One of these geysers – Geysir – has given name to this phenomenon worldwide. Another – Strokkur – provides some of the most spectacular eruptions worldwide. Besides these two here are several more geysers and more than 40 other geothermal features. Haukadalur is one of the numerous sites in Iceland where the volcanic heat reaches the land surface. Local volcano seems to be extinct – there have been no eruptions for 10,000 years at least. This geothermal area has formed at the end of ice age in Laugarfjall rhyolithic dome – a small highland formed by a rhyolite – a rather rare, very resistant rock. Most geysers of the world have formed in rhyolite. All Haukadalur springs and geysers are located on the eastern slope of this hill. The heated water has brought large amount of dissolved silica to the surface, covering it with a thick layer of silica sinter. Whole geothermal field is some 6 km² large – warm springs are found even 4 km from the geyser field. But the most interesting and hottest springs, mudpots and geysers of Iceland are aligned in some 3 km² large area along a fracture in NNE – SSW direction, just a few hundred meters across. Water of springs is classified as sodium bicarbonate thermal water with high content of fluoride. It contains other elements, including a comparatively huge dose of radon. Small streams leave the geothermal field, collecting the water from all the hot springs. In these streams live diverse microorganisms and algae. Even in the hot springs with water temperatures up to 100°C live bacteria which are relicts from earlier periods and have developed unique adaptations to extreme heat. These microorganisms can not survive, if the temperature falls below 70°C. Southern Iceland experiences frequent earthquakes and after larger earthquakes happen some changes in the geyser field. 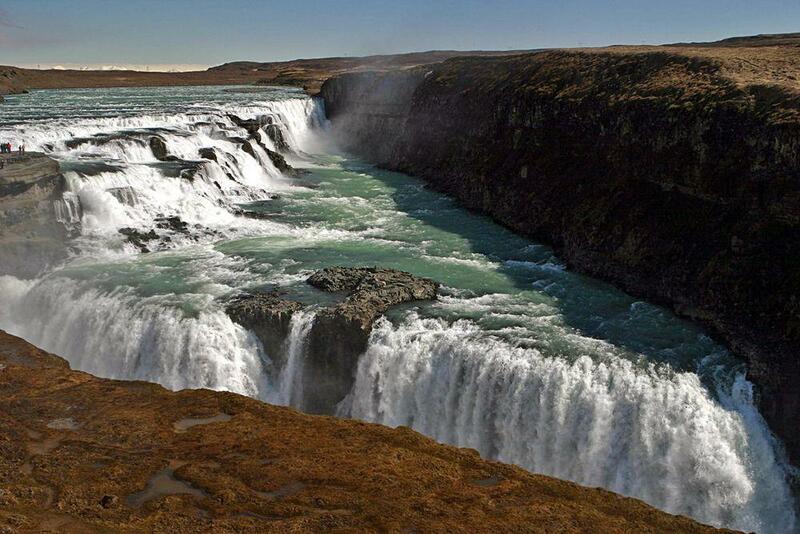 This is what happened in 1294, when Haukadalur hot springs were mentioned for the first time in written sources. Later, in 1630, after such earthquake Geysir started very powerful eruptions – whole area trembled during these eruptions. 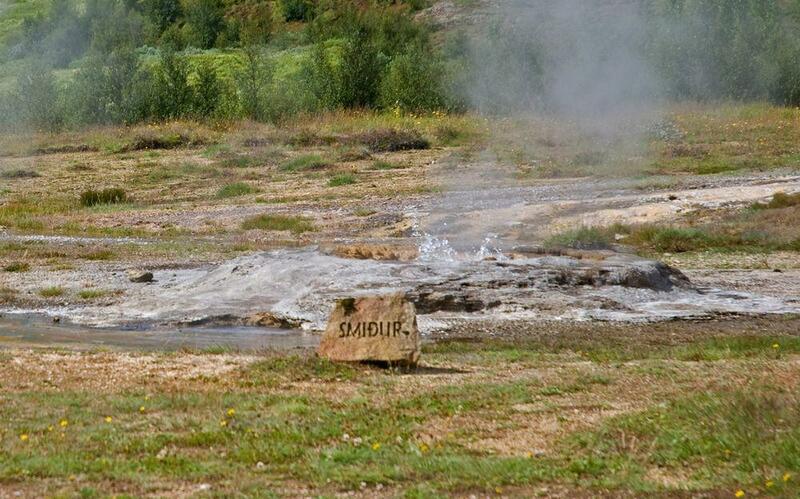 In 1855 the three main "players" of Haukadalur were Geysir, Strokkur and Litli Strokkur. Only Geyser had a mound of sinter in these times. There were counted 40 – 50 other geothermal features. 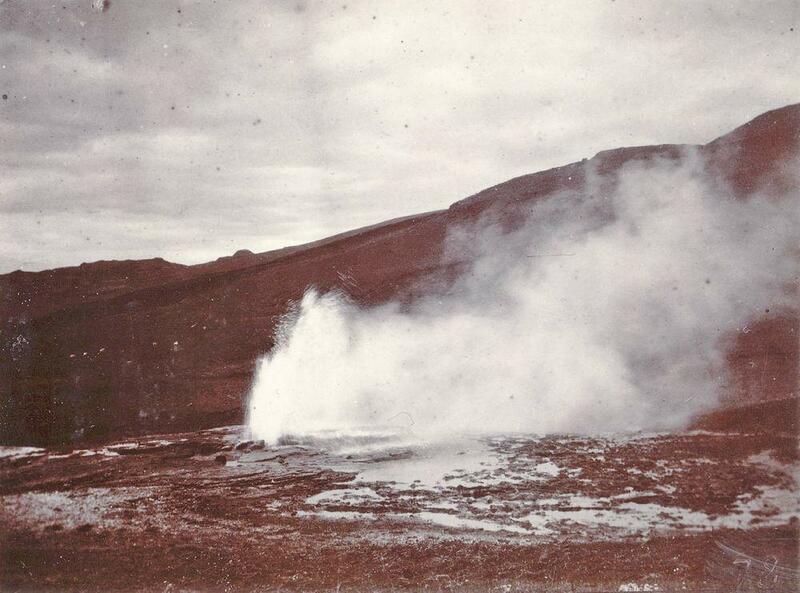 Before 1896 Geysir declined in activity and months could pass between eruptions. Strokkur in meanwhile increased in activity. Earthquakes at the turn of the 20th century revived Geysir, but Strokkur became silent. The smaller geysers of Haukadalur are activated by earthquakes and are practically inactive in between. The amount of water discharged by the hot springs also is changing over the time. Total flow of all hot springs in 1967 was 14 l/s, in 1984 – 13 l/s, in 1994 – 9 l/s. 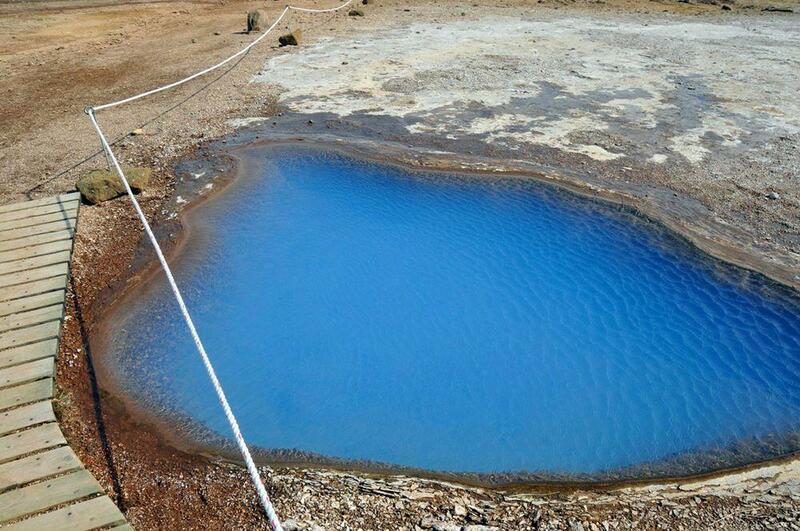 Some consider that negative impact on area is caused by the nearby boreholes in Nedridalur and Helludalur. Blesi, transparent pool / Jennifer Boyer, Flickr.CC BY 2.0. Blesi (the blazer) – hot spring, consisting of two closely located ponds. This is considered to be the most beautiful looking geothermal feature here. Although the ponds are divided by a narrow wall, they differ. In one pool the water is colored in deep blue color by colloidal silica and is 40 – 5° C, but in the other one – clear, around 100°C hot. This spring started vigorous boiling after the earthquakes in June 2000, reaching 0.5 – 1 m high. Earlier travellers washed their clothes here. Blesi, blue pool / anjči, Flickr.CC BY 2.0. Fata (the bucket, pail) – irregular geyser, was more active after the earthquakes of June 2000, now silent. Geysir (Great Geysir) – is the most famous geyser in Iceland which gave its name to geysers worldwide. Currently it behaves like a common hot spring – by far the biggest spring in this area. Although now there are no eruptions observed, earlier in several periods (around 1846, 1900, 1937) the height of eruptions was 60 m.
Haihver (the high hot spring) – hot spring located higher than any other in Haukadalur. Konungshver / Börkur Sigurbjörnsson, Flickr.CC BY 2.0. Konungshver (the king’s hot spring) – hot spring. Started vigorous boiling after the earthquakes in June 2000, reaching 0.5 – 1 m high. The vent of this spring is full with boulders – if these are removed, geyser might start. Litli Geysir (the small geysir) – inactive. 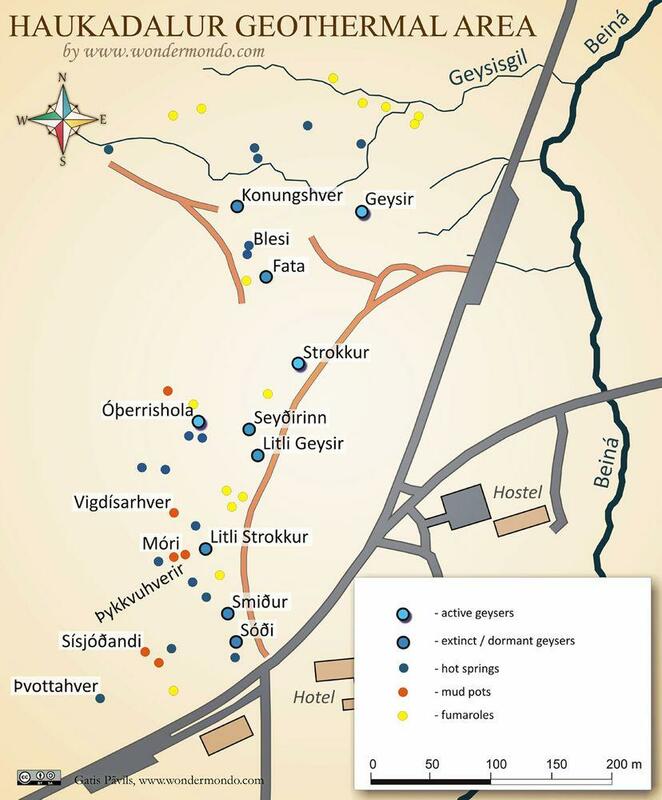 In 1855 and 1871 it was one of three active geysers in the area next to Geysir and Strokkur. Litli Strokkur was very noisy and violent, with very beautiful feathery eruptions, up to 9 m high. Móri (also Moldi) – boiling mud pot. Óþerrishola (Operrishola – "rainmaker", Otherrishola) – small geyser. Very irregular, higher probability of eruption at low atmospheric pressure. Litli Geysir / Börkur Sigurbjörnsson, Flickr.CC BY 2.0. 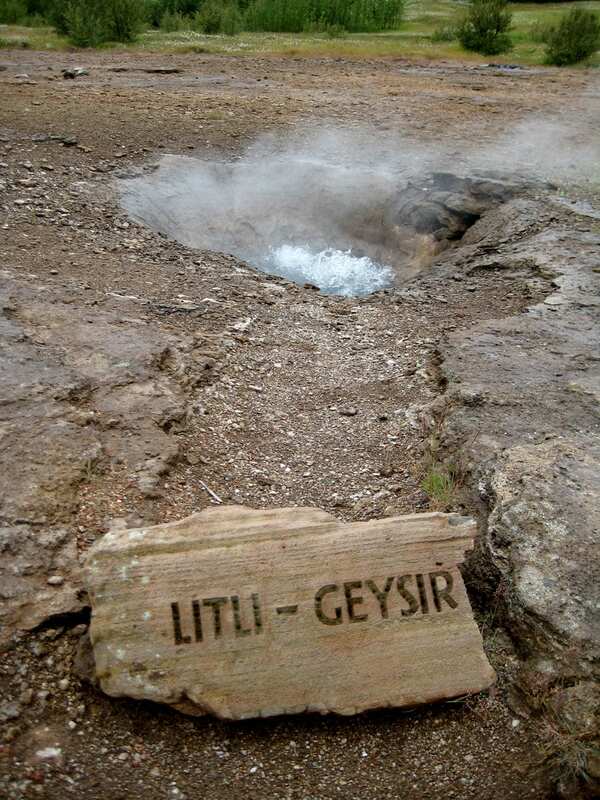 Seyðirinn (the boiler) – dormant geyser, theoretically could be activated by soap, forming few metres high fountain. Sísjóðandi (the eternally boiling) – the largest, constantly boiling mud pot in Thykkuhverir. Earlier the spring was used to wash the clothes, now it is heating the nearby hotel. Smiður (Smidur – the carpenter) – boiling spring without geyser activity. Dug out artificially by a carpenter in 1907 before the visit of the Danish King Frederik VIII. 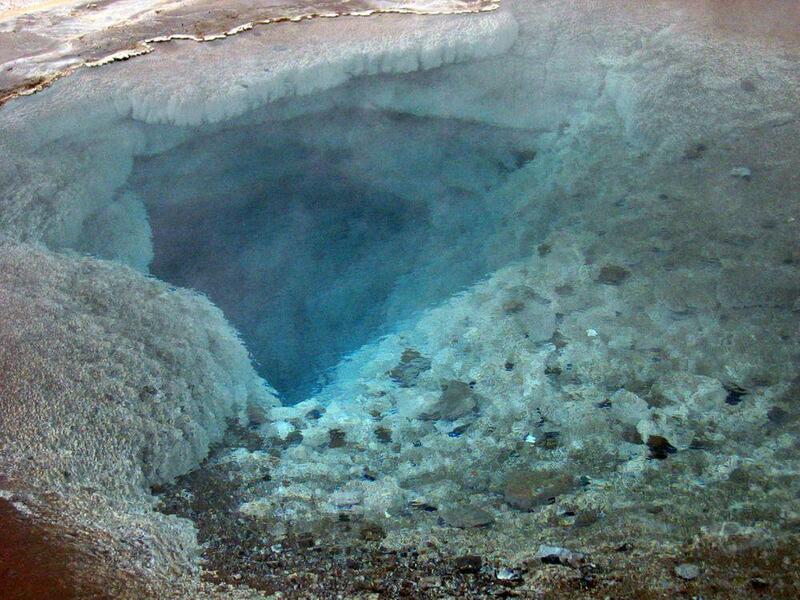 When treated with soap, spring might erupt 3 – 7 m high. A bit to the south is another fervently boiling spring which also can be turned into geyser with soap. Sóði (Sódi, the sod, the messy one) – inactive geyser. First spouted in 1940. If treated with soap, might erupt up to 20 m high. Stjarna (the star) – a geyser which formed in 1896. Soon after it disappeared. Strokkur ("churn") – most active and most attractive geyser in Iceland. Every 10 – 20 (2 – 3) minutes it forms some 20 m tall fountain. Þvottahver (the wash) – hot spring. 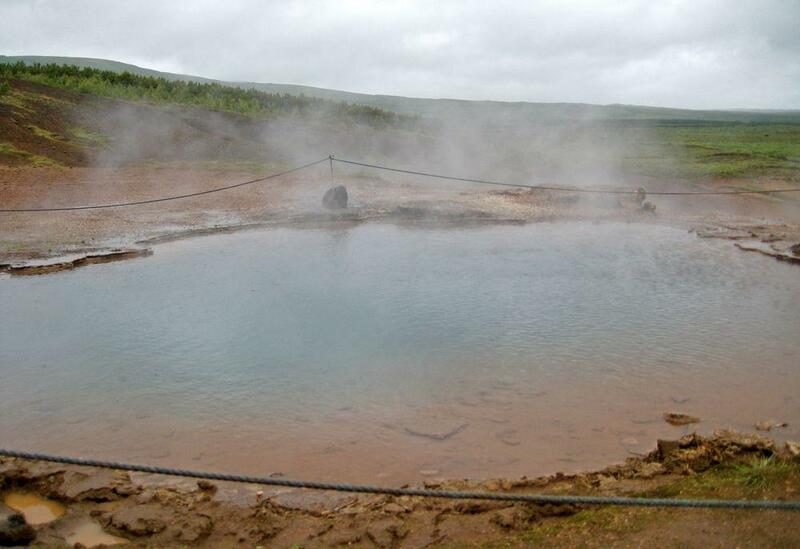 Þykkvuhverir (Thykkuhverir – sticky hot springs) – southern part of geyser field with boiling mud pots. In the hot ground there was baked bread in earlier times. Vigdísarhver – mudpot in orange – brown color, named after the first female president of Iceland. Geysers of Iceland were not the first ones observed by people – in the times of Ancient Greece there was at least one active geyser near Troy, prehistoric people most likely noticed the geysers of Africa, Indonesia and some other places. Often it is mentioned that the word "geysir" appeared in 1294, when after an earthquake locals reportedly noticed gushing fountains. This is wrong – annals of "the men of Oddi" just mention that in Haukadalur some hot springs disappeared and new ones appeared. Nevertheless in the 18th century there appear first known written sources which mention a placename Geysir – the largest geyser in the area. Geyser activity was that surprising to people, that many did not believe that something like this can exist. Thus they word "geysir" (from Old Norse – geysa – to gush, to rush forth) became well known and now is used for every geyser in the world. Geysir has been that surprising and memorable that nowadays many more things are called "geysers" – starting from almost every boiling spring and steamer in the world and ending with water heating devices in Africa. Geysers of Haukadalur since the 18th century turned into a desired destination to guests coming to Iceland. For long time these were the only known geysers in the world and thus attracted lots of interest. The Age of the Enlightement required explanation for this phenomenon – many scientists and people who thought that they are scientists, visited this area and proposed diverse hypothesis. Finally the truth was discovered by the great German scientist Robert Bunsen in 1846 after he spent here 11 days. 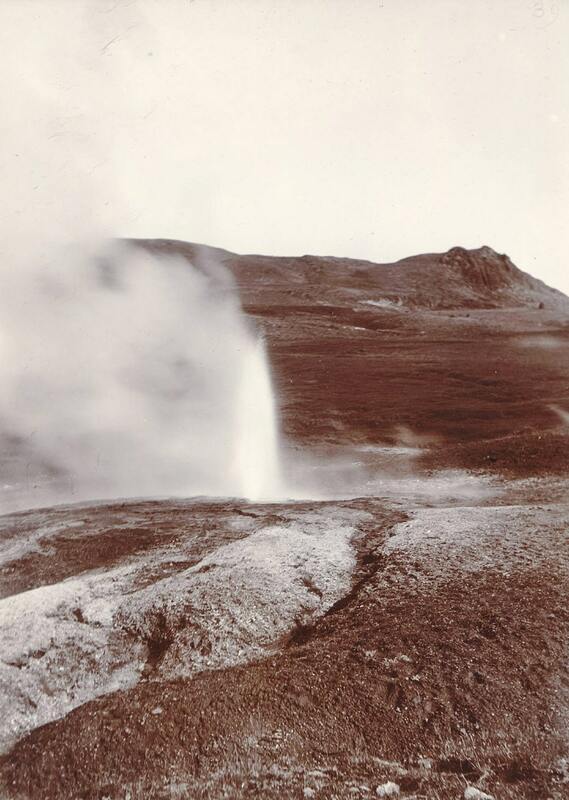 Not always geysers were "behaving" – a tourist spent a fortune but on his arrival the geysers pretended to be dead. Locals knew a recipe for this – after throwing large stones or chunks of peat in the hot spring it went off. Later it was learned that geysers can be activated by soap. Of course, such practice damaged the geysers and finally made them really "dead". The owners of the nearby Laug farm sold the geyser area to Englishman James Craig (future Minister of North Ireland) in 1894, who introduced entrance fee. 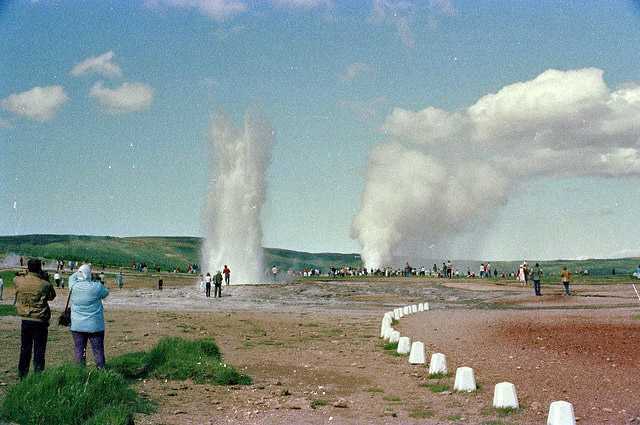 In 1935 the land of Geysir was purchased from its English owners and granted to Icelandic people. Since then the access here is free. There are also legends about Haukadalur. One tells that among the peasants living near Geysir many were wizards. It happened that hot water started to flow between two farms, each belonging to wizards. These wizards were enemies and one of them decided to send the hot water to the other’s house. He drove his wizard’s stick in the ground and started to bite in it. The more he gnawed in it, the more the water flooded towards the neighbour. The second wizard drove his gin the the ground and also gnawed in the stock – the water receded and started to attack his neighbour instead. Finally both wizards were equally strong – the water gathered between both farms, formed a bed and flowed away.